The moon has completed a full revolution around Earth since my last day of work and I haven’t even begun cleaning up my house. But I have seen 149 species of birds, including 5 life birds. January 3, the first workday of the year, was bitterly cold, but I felt an irresistible urge to get out of the house. I drove around a bit and as I returned home, I saw dozens of both Black and Turkey Vultures patrolling my neighborhood and roosting in a backyard pine tree three houses down the street from my house. I stopped my car in front of a neighbor’s house and stood in the street staring in amazement as the vultures flew low over the street. My neighbor came out to ask what I was watching. We talked a bit about the birds as we enjoyed the unusual sight. Just as she walked back to her door, I screamed “Bald Eagle, Bald Eagle!” and she came running back. I shared my binoculars and we watched an adult eagle fly over our heads. This was the first time that I had met this neighbor, yet we jumped up and down and hugged like excited children. She told me that she had seen the eagle perched in a tree in her backyard earlier that day, but did not know what it was. My planned Florida trip was postponed at the last minute due to unexpected events, but my birthday was January 12 and I wanted to celebrate with birds. On an impulse, I signed up for the Georgia Ornithological Society meeting in Tybee Beach, Georgia. The trip got off to a wonderful start with a stop at Savannah NWR on the way to the meeting. Three other birders were in the parking area when I arrived and we all birded the wildlife drive together. Our sightings included a King Rail, who amazed us by walking around right out in the open. 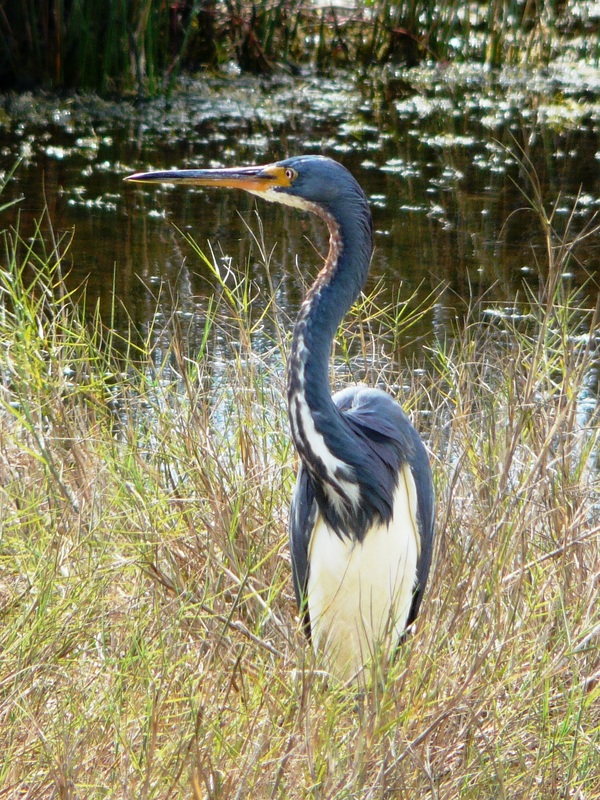 We saw it from as close as 10-15 feet and heard it vocalize. Life bird #1 for 2012! The GOS meeting was great. I continue to be impressed with both the skill and friendliness of Georgia birders. I think that I enjoyed meeting new people as much as I enjoyed the birds. And the meeting delivered life bird #2, a lovely, cooperative Snow Bunting on the beach with the Tybee Island shorebirds. So, what did I learn with all this birding? Female ducks CAN be identified. Except for easy ones like Bufflehead and Ruddy Duck, I previously used the “look for the closest male” method of identifying female ducks. Now I’m motivated to at least try to identify the females. 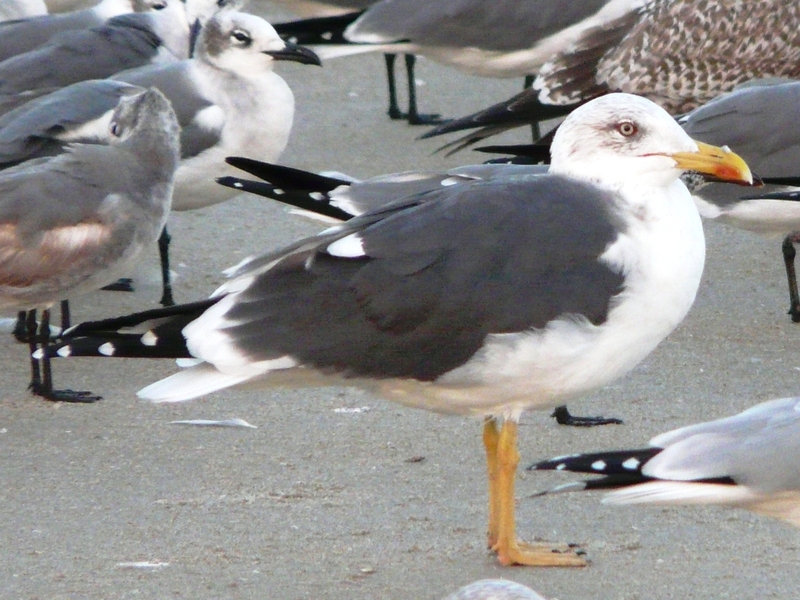 Gulls can be identified, too, even the sub-adults. Now I’m also motivated to work on this group of birds. Pay attention to Willets. This is a beautiful underappreciated bird. And, Eastern and Western Willet will be split, according to shorebird expert Kevin Karlson and other top birders. Western Willets breed in the Great Plains and winter along all US coastlines and down into Mexico. Eastern Willets breed all along the Atlantic and Gulf coasts and winter in South America. They can be distinguished by physical characteristics and voice.